Whisks come in all shapes and sizes. And each type of whisk is designed to serve a different purpose or to more effectively combine ingredients. Take a look at the wide variety of whisks available to decide which ones to add to your kitchen arsenal - chances are you'll want a few different types to use for different tasks. Look for stainless steel whisks, which are less likely to rust. Before buying, hold the whisk in your hand and mimic a whisking motion to make sure the handle is a comfortable shape and thickness. Some whisks have silicone or molded handles, which might be easier to grip, particularly with wet or greasy hands. 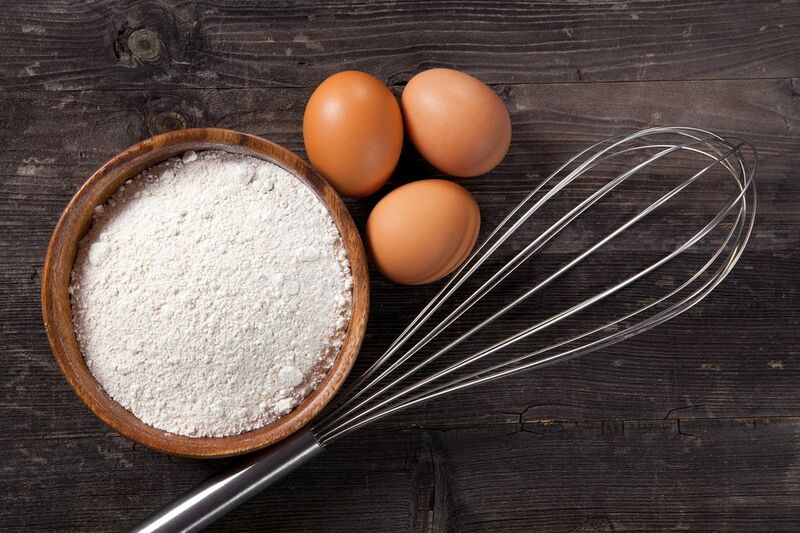 Avoid whisks with a long or heavy metal handle; they'll be top-heavy and are more likely to tip out of the bowl when you're not holding onto it. If you plan to use a whisk in a nonstick pan, seek out one with silicone- or nylon-coated wires, which will not scratch the finish. This is the most traditional whisk, with wires formed into large, wide loops. Since the large size of this whisk is good for mixing voluminous or heavy ingredients, look for relatively stiff wires that will stand up to even heavy mixtures. This type of whisk is especially good for beating a large number of egg whites, because of its generous size and its rounded shape, which sweeps the bottom of a round-based bowl. The size of the whisk ranges in size. One to try: The Cheftime Balloon Whisk, made of stainless steel with a grippy silicone-coated handle. A wire ball is encapsulated within the tines of a round whisk to increase the aeration action. In some designs, the ball is freestanding from the outer wires, in others, it is an inner ball shape that's formed from the outer wires. With either design, it's good for efficiently whipping cream, egg whites or thin batters, but is difficult to clean. One to try: Kuhn Rikon Double Balloon Whisk has a concentric, spherical shape of flexible wires. The wires of this whisk form a more elliptical, narrow shape than in a balloon whisk, which makes this whisk ideal for stirring the lumps out of batters or reaching the crevices of flat-bottomed bowls and pans. If the wires are stiff enough, these whisks are good for combining thick batters or stirring a thick, cooking mixture such as polenta. Because of its narrow shape, it's also handy for combining ingredients in a smaller bowl or a narrow container like a jar or a beaker. One to try: The commercial-quality 8-inch French whisk from Best Manufacturers has a weighted handle for comfort. The wires on this whisk are aligned to form a single layer that turns up slightly at the end, rather than forming a bulbous shape, so this whisk is particularly well-suited to stirring a sauce in a sauté pan, such as a custard, gravy, cheese sauce or cream sauce. Because the wires are aligned, it's also easier to clean than a traditionally shaped whisk. One to try: The Rosle Flat Whisk works with the company's hanging-rack system. A small, springy coil mounted on a long handle makes this whisk ideal for combining small quantities of ingredients in a small bowl or cup, or for making a pan sauce. If you press down on the whisk, it flattens slightly, which can help scrape up ingredients from a flat bowl bottom or from the sides and corners of a pan. This whisk is also called a coil whisk. One to try: The RSVP Endurance Spring Whisk is stainless steel and has a 2-inch coil. This whisk is designed with a series of stiff wires, each capped with a metal or silicone ball. The arrangement of the balls helps agitate the ingredients and incorporate air into meringues, soufflés or cream pie fillings. It's better for lighter, thinner mixtures like thin batters, and the individual ball-capped wires also make it easier to reach pan corners if you're stirring a custard in a saucepan, scrambling eggs, or making a pan gravy. One to try: WMF Profi Plus Ball Whisk has silicone-coated balls that won't scratch nonstick pan finishes and a loop in the handle for hanging. It measures 11 inches. 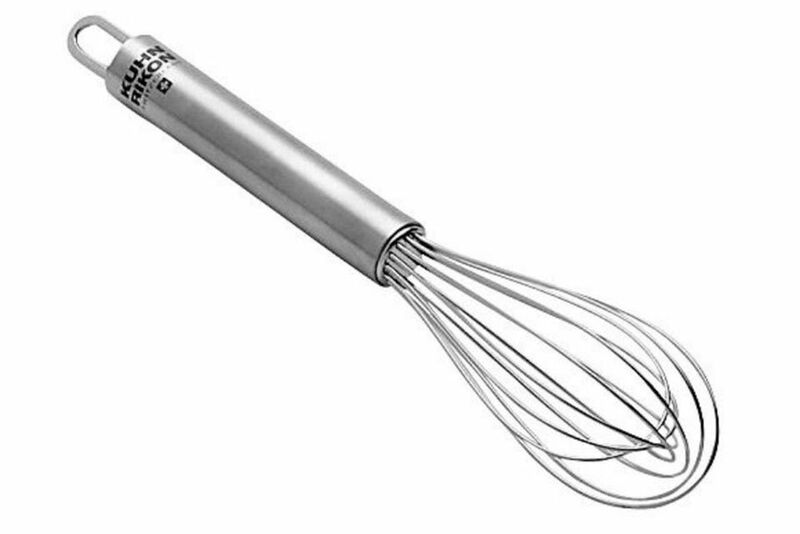 This whisk is shaped like a balloon whisk, but the wires flatten on the bottom to form a flat spiral. It is appropriate to use in a large pan or pot​ since the flat bottom can sweep the surface of the pot and will reach easily into crevices.